Strength training is very important to help prevent injuries and enhance our running performance. Even though this workout focuses more on the lower body, strengthening the entire body is very important because the upper body helps carry a runner through a race, especially a longer one, once the runner starts tiring. Try to do some sort of strength training workout three times a week for the best results. I’m sure a lot of people often wonder what equipment they should purchase for home and travel workouts, so I decided to put together my list of recommended equipment and share it with you. 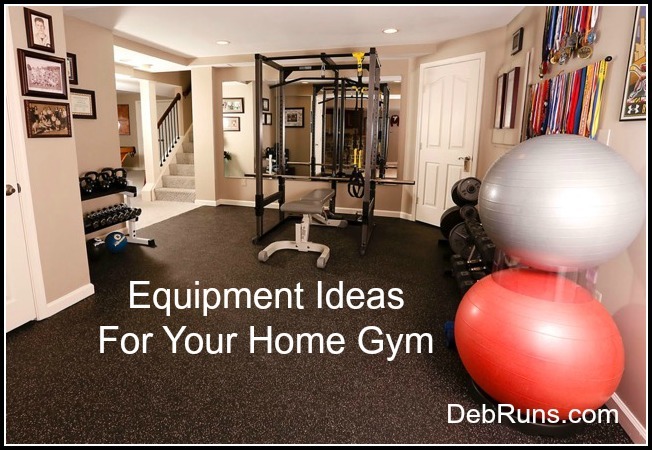 I would recommend starting with a few pieces of equipment and adding as you get stronger or want to add variety to your workouts. Both warm-ups and cool-downs are important for long-term running health. 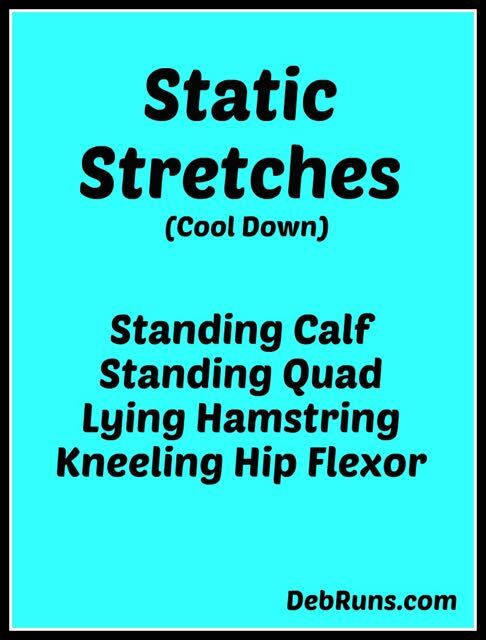 Let’s talk about two different types of stretching – dynamic stretching for warm-ups and static stretching for cool-downs. 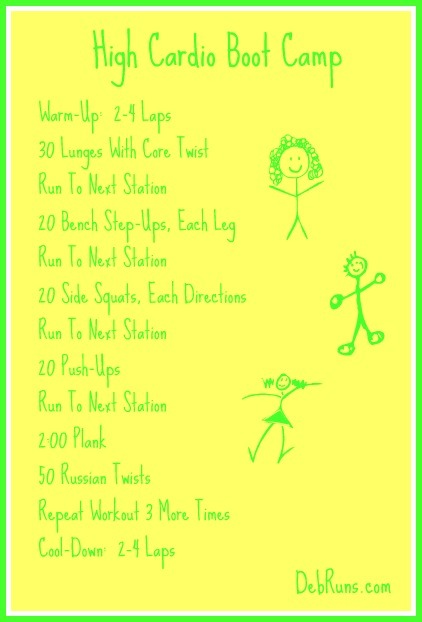 This workout focuses on a variety of strengthening exercises and is designed to run one lap between every two exercises. When going through it one time, it should take about 45 minutes. 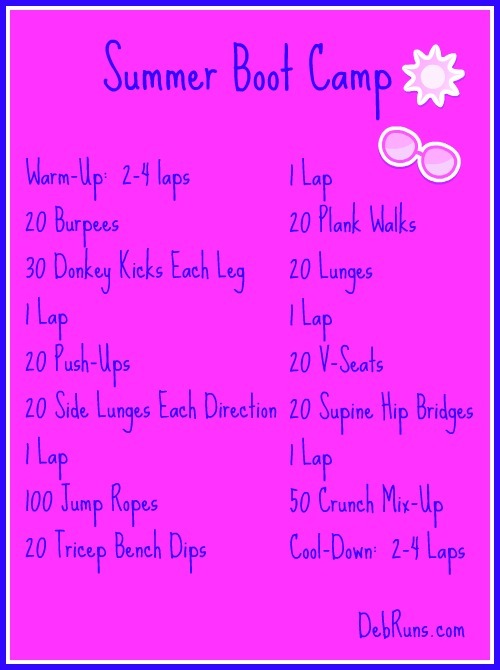 For days when fitting your cardio in is a problem, this higher cardio boot camp is a great one to choose. It’s designed for going through four times in about an hour. 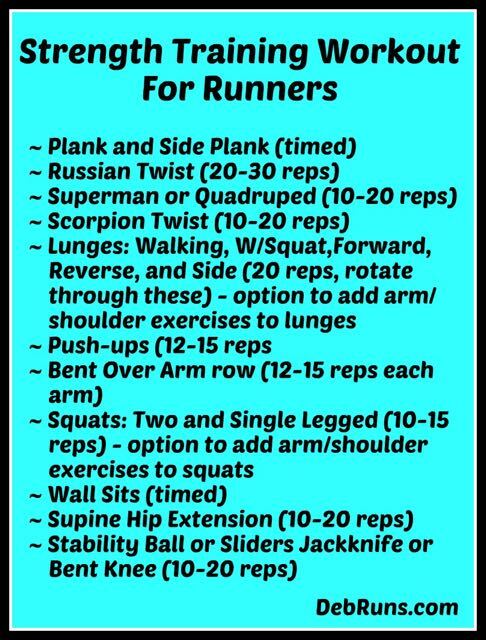 This 45-minute workout has a lot of running incorporated into it, so if you’d like to combine strength training with shorter intervals, this is the workout for you. 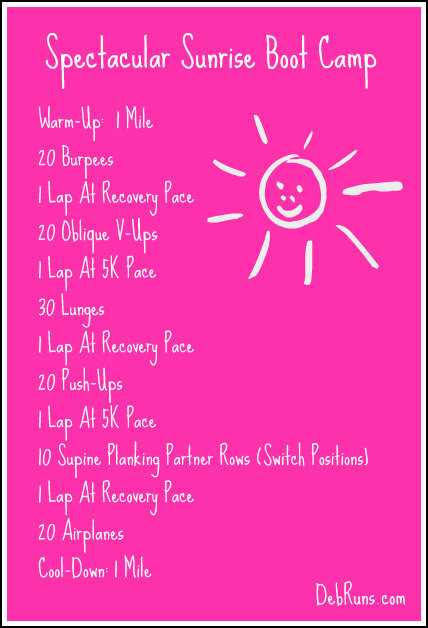 This workout focuses on working the core with each exercise, and is designed to be completed four times in one hour. 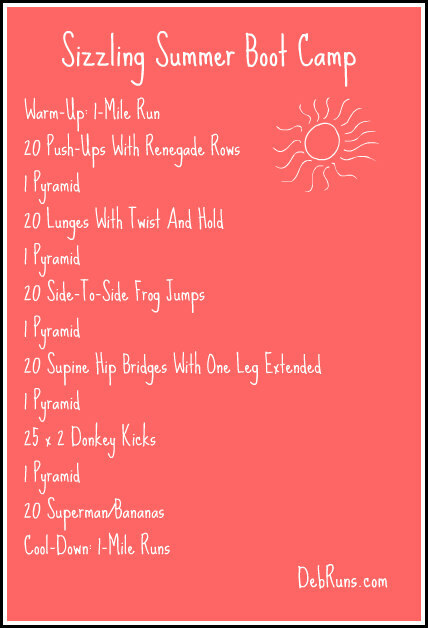 If you’re looking for a fun and no-equipment-needed workout to do while vacationing, look no further. 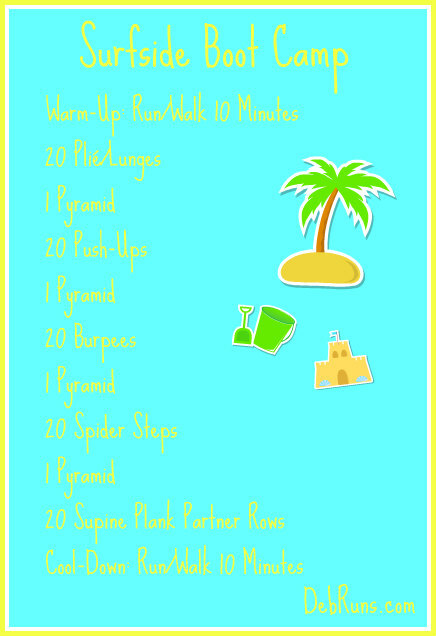 I designed this workout so it can be done on the beach, in your back yard, or in your family room. 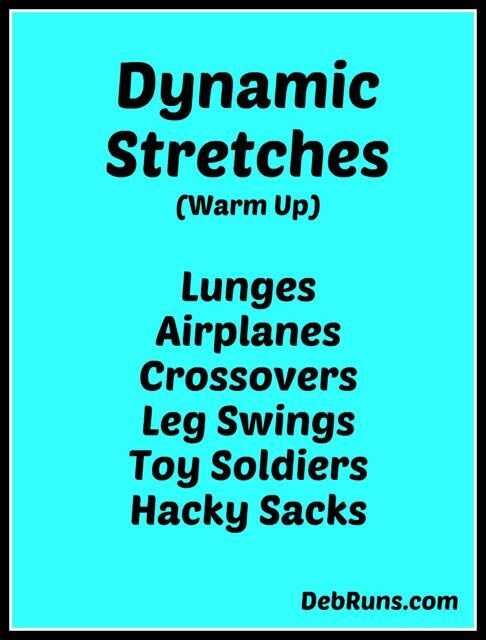 This boot camp has a nice combination of total body strengthening exercises and cardio to keep you breathing hard throughout the workout. 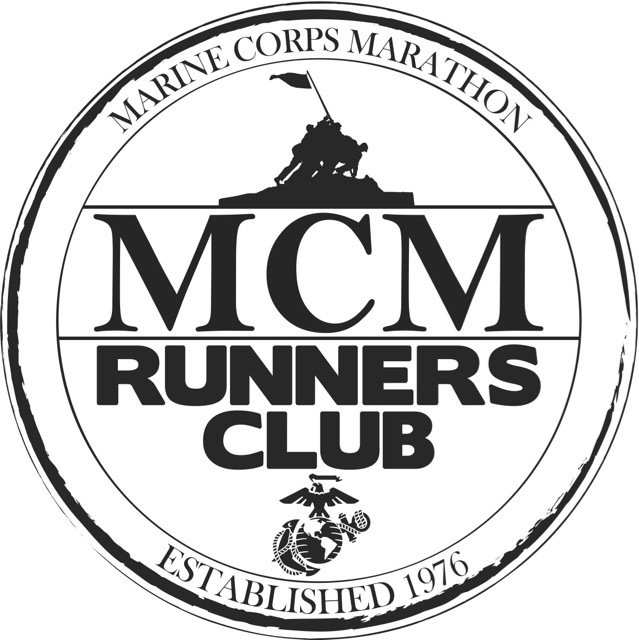 You should be able to complete it in about 55 minutes, including the warm-up and cool-down. Gorgeous sunrise optional! This workout can be done without any equipment, or you can add dumbbells to the renegade rows and a medicine ball or weight to the lunges. 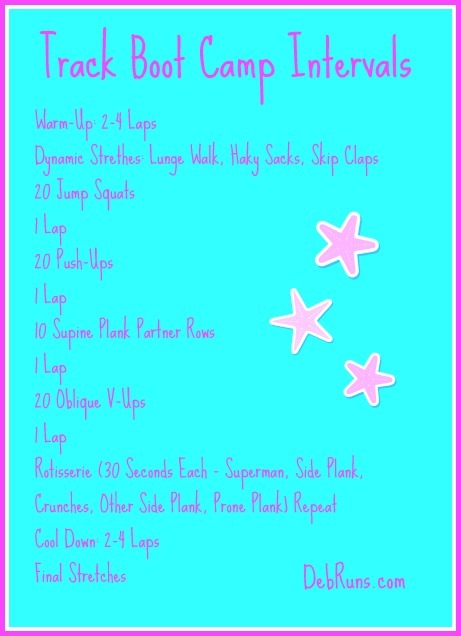 You should be able to make it through this workout once in about 45-50 minutes. 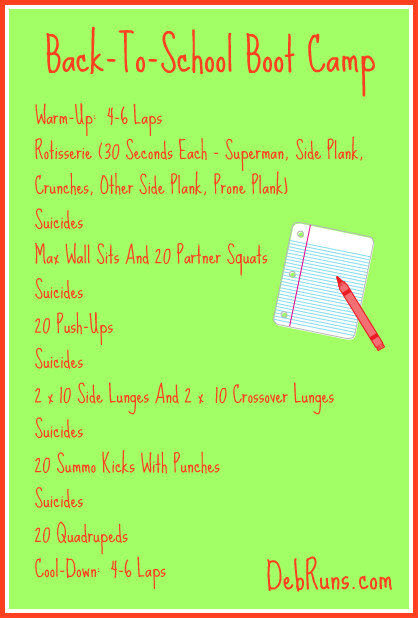 The cardio intervals used in this workout are suicides. In case you’re not familiar with suicides, they are performed by sprinting from line to line on a basketball court or soccer field. Since we were on the track, I used cones as the turnaround points. One suicide consists of running from the first set of cones to the second, touching the ground, turning around, and sprinting back to the starting point. 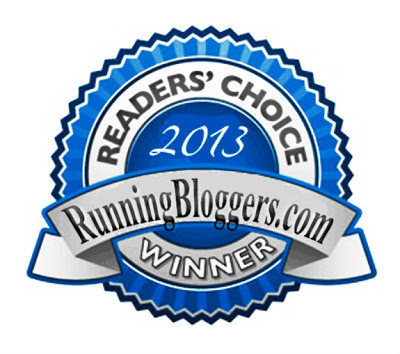 Runners immediately sprint to the second set of cones, touch the ground, turn, and sprint back to the starting line. This goes on as long as there are additional cones or lines to sprint to.